A center within the Office of the Director of National Intelligence has begun to distribute brochures, videos, flyers and other informative materials to increase awareness about foreign intelligence threats and help U.S. companies protect themselves from nation-state actors. “American companies are squarely in the cross-hairs of well-financed nation-state actors, who are routinely breaching private sector networks, stealing proprietary data, and compromising supply chains," William Evanina, director of the National Counterintelligence and Security Center, said in a statement published Monday. “The attacks are persistent, aggressive, and cost our nation jobs, economic advantage, and hundreds of billions of dollars,” Evanina added. The materials under the “Know the Risk, Raise Your Shield” campaign suggest best practices to help the private sector safeguard their data, networks and other assets as well as tackle supply chain risks, spear-phishing, social media deception, economic espionage, foreign travel risks, social engineering and mobile device safety. 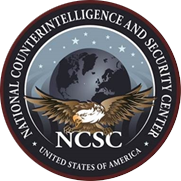 NCSC started to disseminate a report on foreign intelligence initiatives, which intend to steal U.S. trade secrets, intellectual property and other proprietary data through cyber space.